Six colours are available to distinguish between departments and work teams. BRADY, represented in Australia by Farnell InOne , has released Safety Plus Padlocks. They are compact and lightweight, designed to keep workers safe and equipment free from damage. They are made of reinforced nylon with a hardened steel shackle. 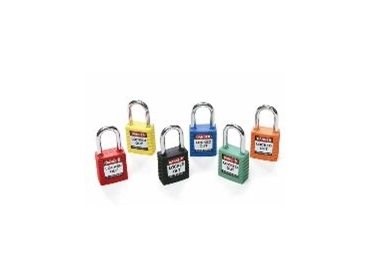 The padlocks are corrosion and chemical-resistant, making them suitable for use in harsh environments. It is spark-resistant, nonconductive body makes it an suitable for use in electrical applications. They have a keyway that protects workers from shock when inserting key. The six-pin reserved-use cylinder delivers optimum security and tamper-proofing. The locks meets OH&S lockout requirements and come with two keys and danger labels. Six colours are available to distinguish between departments and work teams.